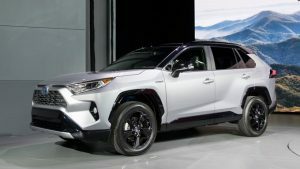 TORONTO, ON: The first-ever Toyota RAV4 was a game-changing model when it launched – and now the 2019 Toyota RAV4 Hybrid is ready to rewrite the rules, all over again. That’s because this all-new hybrid compact SUV proves – without a doubt – that Toyota’s gasoline-electric hybrid technology results in a superior powertrain at a price that makes remarkable sense. The 2019 Toyota RAV4 Hybrid shares many features in common with the 2019 Toyota RAV4. Both are the product of the Toyota New Global Architecture (TNGA) – a tight integration of design and engineering that results in a superior platform and powertrain. But then the RAV4 Hybrid does more – much more. Built around the Toyota Hybrid System II – the latest iteration of the world’s most proven and popular gasoline-electric hybrid technology – the RAV4 Hybrid features a 2.5-litre Dynamic Force 4-cylinder Atkinson Cycle engine coupled to high-torque electric motor/generators and a smooth and efficient continuously variable transmission. The result is a 219-net system horsepower. What’s more, Toyota’s newest All-Wheel Drive system (AWD) increases torque to the rear wheels by 30 per cent over the previous generation’s AWD-i system – contributing to an unparalleled driving experience. And the RAV4 Hybrid does all this with a starting MSRP that’s just $1,400 above the equivalent, conventionally-powered RAV4 model. Toyota has closed the price gap significantly: For example, the 2018 RAV4 Hybrid LE was $4,775 more than its 2018 gasoline-powered equivalent. For most drivers, it’s expected that the fuel savings alone will pay back that premium for the RAV4 Hybrid in approximately 2.2 years – and over the lifetime of the vehicle, the cost of ownership will actually be less. The all-new 2019 Toyota RAV4 Hybrid goes on sale this spring at Toyota Dealers across Canada.